Each delivery will include 1 pound of wild Alaskan coho salmon + 1 pound of white fish, which features cod, halibut, or rockfish. Cuts may include 1/2 pound fillets, 1/2 pound steaks, or 1 pound fillets. They will be frozen, packed in a thermal bag with ice packs to keep cold. The Starbird Fish crew fishes in one of the world’s most sustainably managed fishing areas, in the cold waters off the coast of Alaska. Their fish is packaged and frozen within 24 hours of catch to maximize freshness and quality, then shipped here to Vermont. Mild, tender white fish - cod, halibut, and rockfish - is extremely versatile. It tastes great when grilled, baked, or breaded and fried, and is delicious in tacos, soups, and stews. Wild Alaskan salmon is great for baking, broiling, or grilling, and pairs well with a wide range of flavors and seasonings. Fillets are simple to prepare- they can be defrosted quickly or even cooked frozen. Each half-pound fillet will serve 1-2 people. Each monthly delivery will include 8, 6" tortillas, plus one pint of cooked black beans. Tortillas from All Souls Tortilleria are made with organic corn. Grains for Hearty Heirloom tortillas are sourced from organic farms in Vermont and New York. Grains for Soft White tortillas are sourced directly from an organic family farm in Indiana. Beans from Vermont Bean Crafters will include black beans, soldier beans, pinto beans, and possibly other varieties as well! These will be frozen, packed in a thermal bag with ice packs to keep cold. Tortillas and black beans are naturally vegan and gluten-free. All Souls tortillas are made uses the traditional nixtamal process: whole kernel corn is cooked in water with limestone, then stone-ground to unlock flavor and nutrients, and finally formed into tortillas and baked over flame. Vermont Bean Crafters works with small-scale, certified organic farms in Vermont, New York, and Maine. They source a variety of heirloom beans and grains from these farms. They are pre-cooked, and delivered frozen. These tortillas and beans have quickly become staff favorites, and they're perfect for pairing with a wide range of Vermont Vegetables! Beans can be served as a side dish, or added to soups, dips, or salads. Serve tacos or quesadillas with root vegetables and cabbage slaw, or fill with grilled or roasted vegetables, beef, pork, chicken, or fish. We also love making a large casserole with layers of tortillas, veggies, and beans! Yum! Each delivery will include two 1lb packages of grass fed beef, frozen, packed in a thermal bag with ice packs to keep cold. Maple Wind Farm and Health Hero Farm raise Angus-Devon cows using management-intensive grazing. This type of grazing means cows are moved to fresh pasture daily to ensure the best quality nutrition, while pastures are improved and grassed are regenerated. "100% grass fed" means grass fed and grass finished: cows are fed only grass and hay – never grains, antibiotics, or hormones. Our grass-fed ground beef is lean, nutritious, and flavorful, and a favorite kitchen staple for our members. Learn More: Why Grass Fed Beef? Enjoy lean and flavorful ground beef as the beginning for a great burger, meat sauce, or taco night! This is one of our member favorites, because it's so simple to prepare, and always a great crowd-pleaser. Besteyfield Farm's hens are raised on pasture in warmer months, and in greenhouses during colder months. Their diet includes a healthy mix of grain, pasture, and food scraps from local farms and co-ops. Feeding fresh food scraps gives these hens a boost of vitamins, minerals, and nutrients, and it also helps prevent food waste from local farms and businesses! Fun Fact: Besteyfield Farm started as an "incubator farm" in the Intervale Center's Beginning Farms program. After completing the program, Ben Butterfield and his family moved their "rather contented hens" to a farm in Hinesburg, Vermont, where they can continue to grow their business, raise happy hens, and provide us with very high-quality eggs! Eggs provide a versatile and affordable protein source at any meal of the day. Try egg sandwiches for breakfast, slice hard-boiled eggs on salad for lunch, make quick veggie omelettes for dinner, and serve up a scramble for weekend brunch! Eggs are great to have on hand for baking, too. Each monthly delivery will include 4 bean burgers: two Black Bean burgers + two Maple Chipotle burgers. They will be delivered frozen, packed in a thermal bag with ice packs if needed to keep cold. Vermont Bean Crafters bean burgers are crafted with care using the best local ingredients available, including local organic vegetables and grains, as well as organic spice blends. Even their beans come from regional, small-scale organic farms! We love eating bean burgers in a variety of ways, whether between a bun, filling a taco or quesadilla, or fried up in a breakfast hash. They're great staples to quickly add protein to any meal. 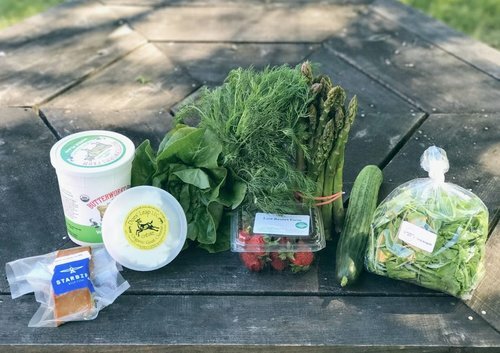 The Omnivore Package includes your choice of Vermont Vegetable Package, paired with a wide variety of local meat, dairy, and specialty products, for a well-rounded weekly menu. When it comes to our specialty items, we use the same priorities listed above. We look for value-added products that come from Vermont farms, prioritize certified organic products, and always stand behind the quality, flavor, and value of every product. Pricing Note: Prices above reflect the average weekly value for each package. When you sign up, your grand total will include the cost for the full season, which can be paid in full or in monthly installments. The actual value for each delivery will vary slightly from week to week, depending on what is in season and the mix of ingredients each week. A selection of seasonal organic & sustainably-grown vegetables, fruit, and herbs. We source the best food available from our community of more than 30 Vermont farmers! You'll love creating simple, healthy meals at home that focus on fresh produce. This package will offer the widest variety of fruits, vegetables, and herbs over the course of the season, for adventurous seasonal eaters! A new option for 2018! Below is a list of the fresh fruit, vegetable, and herb varieties that we have planned for the Fall/Winter Season! PLEASE NOTE that this is highly subject to change based on what is harvested by our partner farms! Your weekly newsletter will tell you exactly what items are coming each week. Items in bold show you the items that will only be featured in the Variety Package each month. For inspiration, take a look at our 23 Favorite Fall/Winter Recipes blog post! If you have food allergies, please let us know so that we can mark your account and swap for a different item. You can feel good knowing that you're eating food that's good for you, good for Vermont, and good for the Earth. All of our Vermont Vegetable Packages include 90% or more certified organic vegetables, berries, and herbs. Vegetables grown using Vermont Ecologically Grown Practices from Lewis Creek Farm. In the rare event that we are unable to find the vegetable we’re looking for at the last minute - for example, if a farm’s harvest is off schedule - we may source from Deep Root Organic Cooperative, an Vermont business that works with organic farms in Vermont and Quebec. Learn More about our practices for Sourcing Local Food and Filling the Gaps on the blog. The College Fall Season begins the week of September 10, 2018. All College Fall subscription options are the same as our Summer subscription options. Please refer to the September and October layouts above to see what ingredients will be featured in the overlapping weeks. College Fall deliveries in November/December will overlap with 4 weeks of our Fall/Winter Season.